For well over 10 years, our team has set the standard for reliability, performance, and innovation in shredded dough equipment for a variety of foodservice applications. 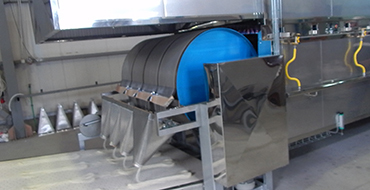 Our speciality kunafa machine lines are designed and engineered to produce consistently reliable results, clean up quickly and easily, and reduce labour costs in every workplace. At Kataifi Machine, we design and manufacture professional food service equipment that perform consistently and reliably year after year, no matter the continuous lengths of application. Our Automatic kataifi makers are designed to last, withstand heavy use, and require little maintenance. This dedication to our dough craft and our customers instils in us a profound sense of responsibility to continue our tradition of excellence and maintain our stringent standards for workmanship and durability. Our family-owned company is known for its shared values, which provide the basis for the way our employees act and make decisions, and enable responsible collaboration with our business partners and colleagues. Our success is anchored in trust, quality, responsibility, respect, partnership, passion, innovation and a willingness to change. We’re very proud that major food service chains and plants rely on our machines. But what really makes the extra effort and attention to detail that we apply worth it is when independent entrepreneurs write us and tell us how satisfied they are with our equipment and how it has allowed them to remain competitive.